Product specifications may vary from item in video. Always verify product specifications on this product page. 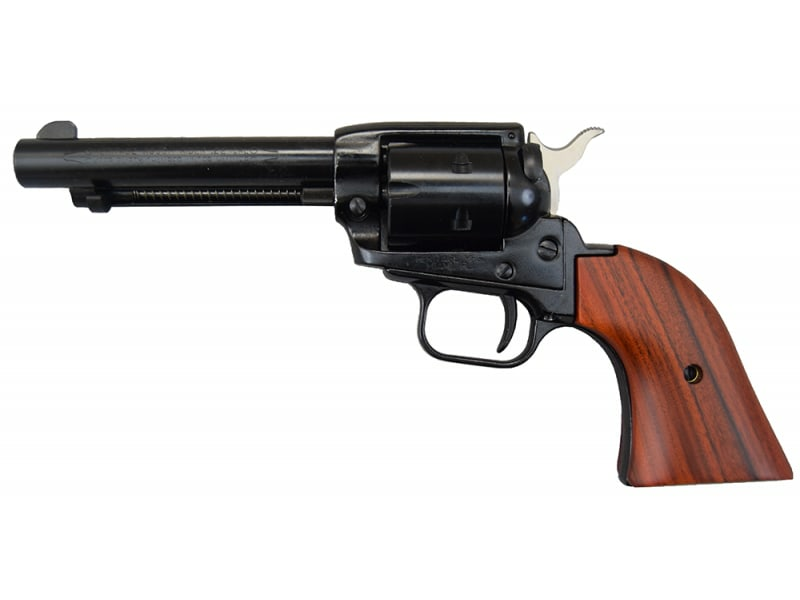 Heritage Arms RR22B4: Born of the Traditions of the Old West, the Rough Rider maintains much of the look and feel of the legendary Single Action Army revolver, only in a scaled down version. Chambered for the 22 LR, the Rough Rider is manufactured using state of the art precision machinery that assures its accuracy and reliability. 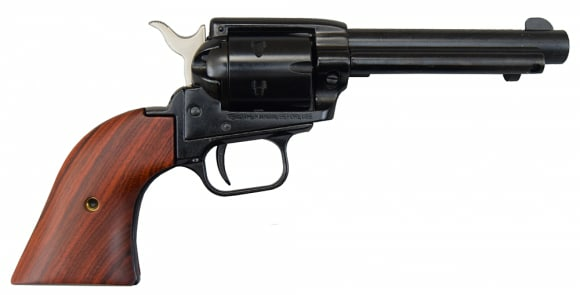 Born of the Traditions of the Old West, the Rough Rider maintains much of the look and feel of the Legendary Single Action Army Revolver, only in a scaled down version. Chambered for the .22 LR the Rough Rider is manufactured using state-of-the-art-precision machinery that assures its accuracy and reliability. The cylinder lock up is tight and the perfect timing of the action makes for a handgun that will put its shots where you want 'em. The machined barrel is micro-threaded, and inserted into the frame for the optimal barrel/cylinder gap to give you maximum ammunition performance. A hammer block in the recoil shield provides extra protection and has a red dot indicator that lets you know when the gun is ready for action. A new authentic looking flat-sided hammer paired with new exotic laminated grips, makes this Rough Rider both functional and handsome. Ideal for hunting, plinking or western action shooting. 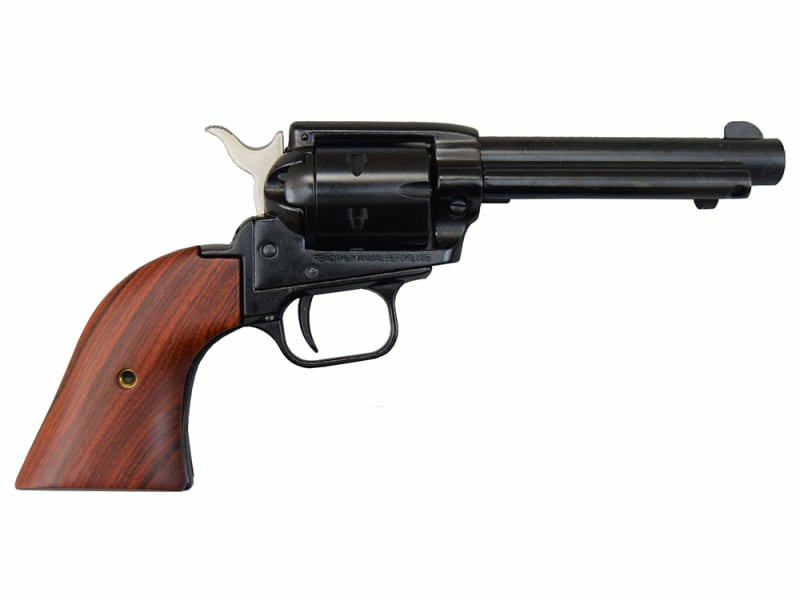 Let the Rough Rider be your choice in a new rimfire revolver. PROUDLY MADE IN OUR USA. 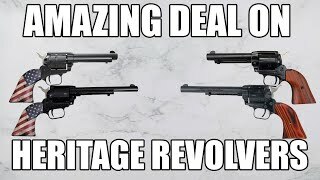 All Heritage revolvers combine quality and affordability ... an American tradition. This has consistantly been one of the top selling handguns in the United States for the last 2 decades. And why not. They look great, they work great and they are at a great price. Heritage Rough Rider .22 LR Caliber revolver, Blued finish, 4.75" Barrel, Wood Grips.